10.4" Color TFT daylight viewable LCD with anti-reflective coating. High-performance signal processing. RGB output to connect to external monitor. Accepts CCD camera input, (cable included). Dual-speed versions allow selection of standard 24 RPM or 48 RPM antenna rotation. Exclusive dual range radar function lets you have split-screen display of both long and short-range simultaneously. It's like having two radars in one. True Trail Function clearly identifies moving targets from stationary targets like land or buoys. Exclusive True Trail feature clearly identifies moving targets from stationary targets. The LCD and acrylic sheet with Anti-reflection coated filter are bonded directly to increase visibility in direct sunlight and prevent condensation. Built-in ATA (Automatic Tracking Aid) tracks up to 50 targets. 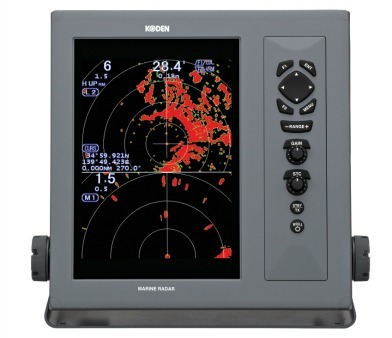 Built-in AIS (Automatic identification System) interface displays up to 100 targets.